that WorldCall is actually not a Broadband but they call it broadband. PTCL - EVDO is good, it usually give speed from 100 kbs to 400 kbs. On average it give 3 to 4 times faster speed than the EVDO. On multiple different forums i have read exremely -ve comments about WorldCall Wireless Broadband. Anyway if you are used wireless USB stick then please update us the average speed. ??? Average speed i get 700kbps to 900kbps.Also works fine on torrents. Are you sure 700 to 900 kbs of EVO speed? I had been using the EVO and i never find speed above 500 kbs while its usual speed remain between 100 - 400 kbs. With which tool you measure the connection speed? Sure learner bhai,i always moniter its speed by its mobile partener software. Its speed depends upon signal strength,how much signal do you get. Yes i used both sites but my view www.interfrog gives more accurate results. Download speed is 394 kbs. It means your EVO get stronger signals. :) that good. But with Wateen Wimax USB offtime hours i get 1000 kbs. I think its not a broadband. You right Learner bro,but they ask it broad band ,i had also used it. But for mobility purpose it works okay for market watch for those who cant afford evo or wateen wimax. Also i have heard wi-tribe wimax dongle is also good.but it has no coverage in most of the areas. 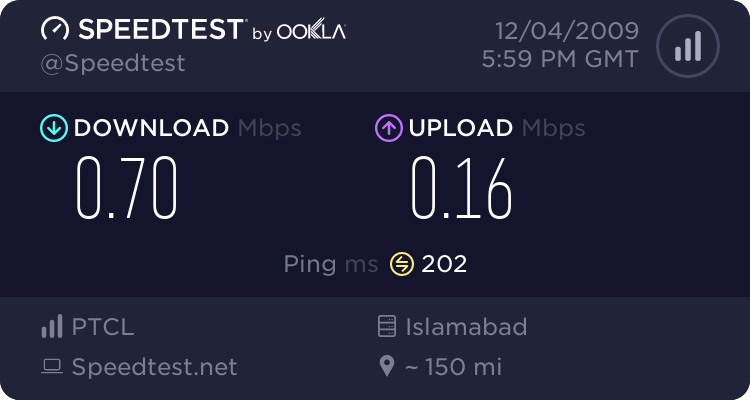 1 Mbps + 5 GB connection in just Rs. 800 per month. 1 Mbps + 10 GB connection in Rs. 1100 per month. 1 Mbps + Unlimited connection in Rs. 1300 per month. While EVO is unlimited = Rs. 2000.